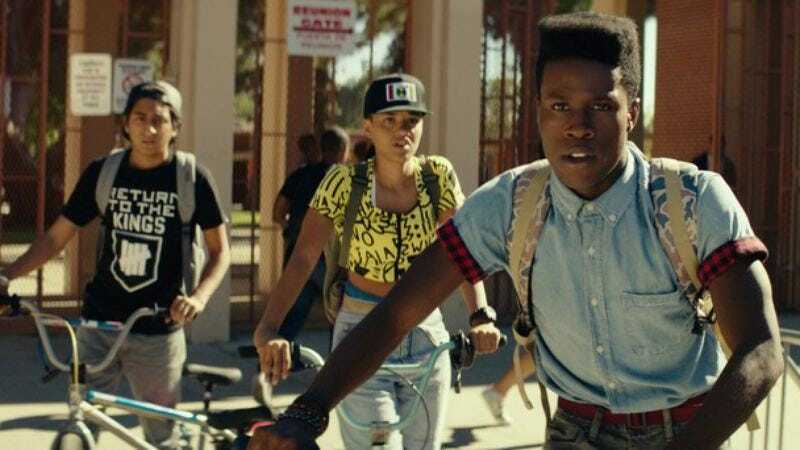 Early buzz suggests that Rick Famuyiwa’s Dope (in theaters June 19) is going to be one of the hippest movies in years. It’s got young people, it’s got retro ’90s fashion, it’s got a comedic misunderstanding involving a bag of drugs, and it’s got enough trendy tech devices to fill a drug-filled backpack (you’d have to move the drugs out of the way, of course). Now, according to The Wrap, MovieTickets.com and GoCoin have come up with a super hip way for you to pay to see this super hip movie: In what’s being billed as “an apparent first for a movie studio,” you can use Bitcoin to buy tickets to see Dope. There’s even a scene in the movie where the main character, Malcolm (Shameik Moore), says, “I just read that money as we know it is dead. Soon the world is only going to buy and sell products using Bitcoins.” Ignoring the fact that this is a little silly because Bitcoin is a dumb thing that only tech nerds care about, it’s still interesting to see the movie put its Bitcoins where its mouth is. The Wrap also says that using Bitcoins to buy and sell drugs later becomes a plot point in the movie, so maybe Dope will inspire people to use whatever Bitcoins they have left over from buying the tickets to buy some drugs.